Bhaijaan puts in lot of jaan! Inordinate delay in watching and reviewing Bajrangi Bhaijaan (BB) was purely intentional. Off late, I have developed an auto immune allergic reaction to Bhaijaan and he has instigated bouts of migraine most of the times with his kicks and Jai Hos. Last time I adored him in Tere Naam 12 years back and he surprised me (not floored) again in BB. To make any good movie, basic foundation stone is a strong script , a director with IQ level above 100 and lead actor who doesn't interfere in the concept. Luckily 2/3 things worked for BB. Salman Khan has given up his goons bashing, train stopping, larger than life avatar to portray a believable character. I won't appreciate his acting prowess here but would definitely admire his attempt to do something different. Thankfully, script is written by a KV Vijay (of Baahubali fame) and he has penned down something with a fresh appeal. Plot is pretty much predictable and Bajrangi's character is shown way too naive. 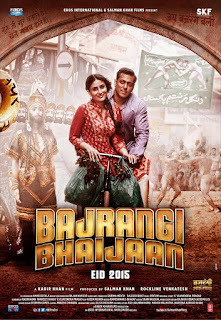 But, the film has a "feel good" appeal and the chemistry between Bajrangi and Munni has some magical moments. For a change, this movie doesn't show Pakistan in bad light. To a large extent, I would attribute success of BB to child actor Harshaali Malhotra. Her innocent smile and charming presence wins your heart completely. Character of Nawaz is based on youtube sensation Chand Nawab, which was a hilarious deja-vu. Nawaz was brought in towards 2nd half but that infuses energy into the film at right time. Rajesh Sharma has a small role but I loved his work. He is becoming one of the sought after actors for character roles post Tanu Weds Manu Returns. Rest of the characters were mostly placeholders without any impact. Entry of Salman is picturized beautifully with Selfie Le Le Re. More than the lyrics and Music, I loved the colorful visuals and slow motion shots. Song has a typical UP vernacular appeal. Bhar do jholi meri is a classical qawwali with characteristic trance-sufi appeal. Adnan Sami has rendered it beautifully though I wish Sabri brothers also got their credit. Scenes of Pakistan have beautiful cinematography with locales of Mandawa, Jhunjunu, Sonmarg and Zozi La. Verdict: This is one of the clean movies which can be watched with entire family. It is just one of those above average films, which are good to watch but offers nothing great to remember. I have showered my appreciation because Bhaijaan had set up a very very low benchmark for him in last decade. Loved your review again Amit. Thanks for adding video links.